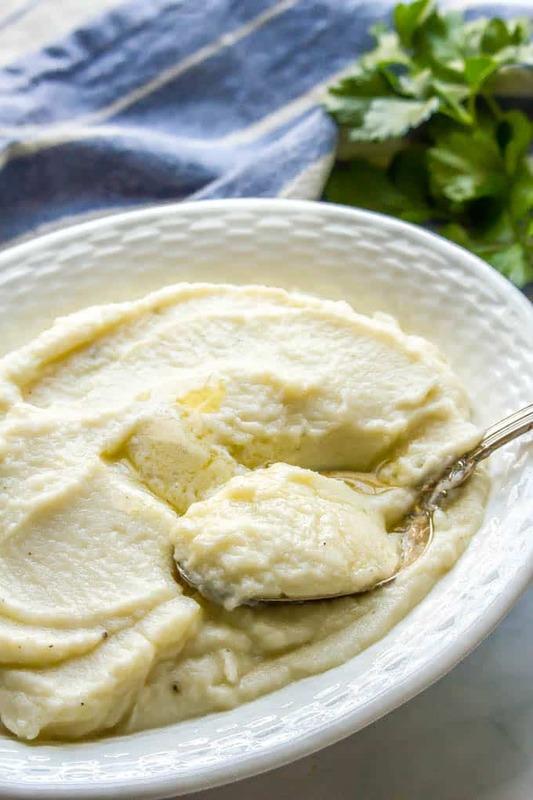 Healthy mashed cauliflower is creamy, smooth and an easy, delicious low-carb option for a dinner side dish. 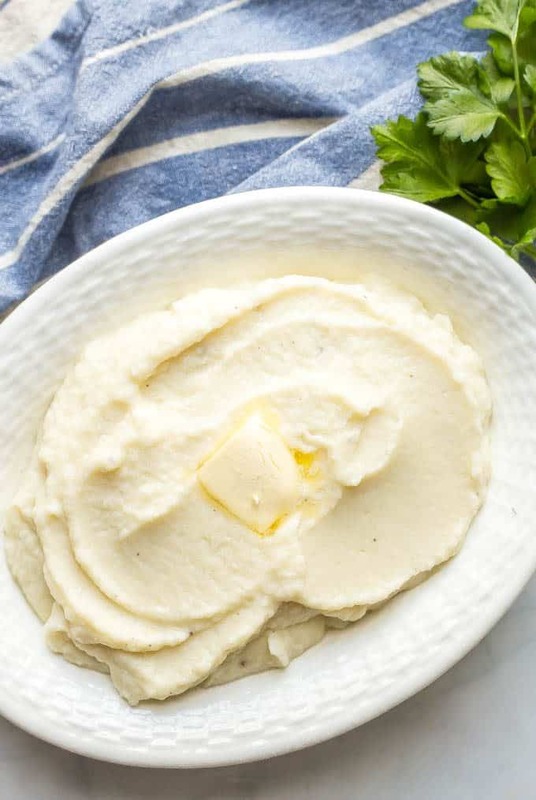 Just 4 ingredients and ready in just 20 minutes, you’ll love this mashed cauliflower on its own or with your favorite potato toppings! Anyway, now we’re entering the back-to-school season, which always seems like a good time to hit the reset button. Both in terms of starting fresh with a new year, but also with hitting reset on our routines in the kitchen. Ready for some more healthy, homemade foods and family dinners. 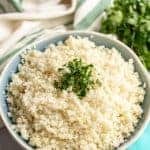 And this healthy mashed cauliflower is a delicious way to get more veggies in my family’s meals! Now, to be clear, you’re not going to be fooling anyone with this dish. 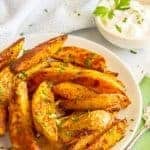 It tastes like cauliflower, not potatoes. As it should. But it’s WAY lower in carbs, gives you an extra veggie for the day, and you can happily eat forkful after forkful. And this is my boy who happily chows down on carrots, steals bites of my veggie burgers and still devours okra couscous. To be fair though, he’s not a fan of mashed potatoes either. Crazy kid. 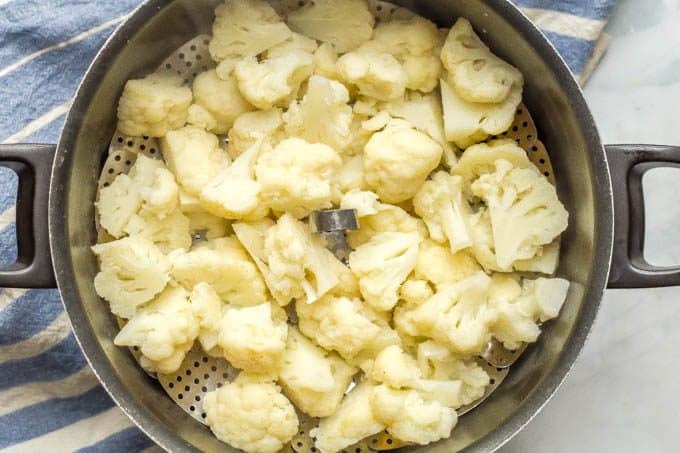 I steam my cauliflower in a steamer basket on the stove, but you could also microwave it in a bowl with some water then drain it. 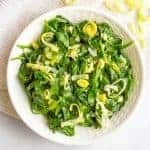 You want to get the cauliflower as dry as possible after it’s cooked. Extra water will make the mashed cauliflower a little mushy. 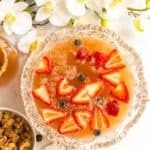 I use a food processor to help control the texture, but I think you could use a blender or hand blender if that’s all you have. You can also try mashing it by hand but you won’t be able to get it as smooth. Don’t forget the toppings! 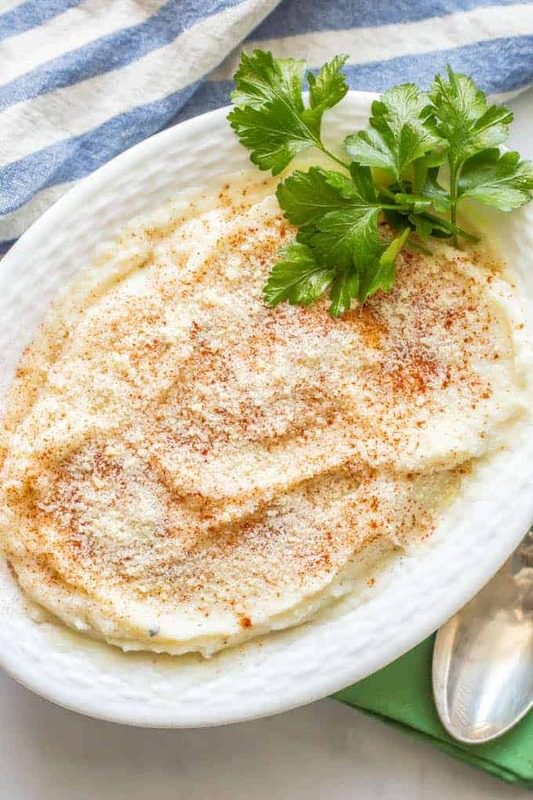 Add any of your favorite mashed potato toppings to this – extra butter, chives, a sprinkling of paprika, shredded cheese or cooked, crumbled bacon. You know I love some toppings. Plus, cauliflower has a bit of sweetness to it and I like having a savory topping to balance it out. And if you’re feeling a little wary, start off by doing half mashed potatoes and half mashed cauliflower and try it that way. You’ll still be lightening things up quite a bit! 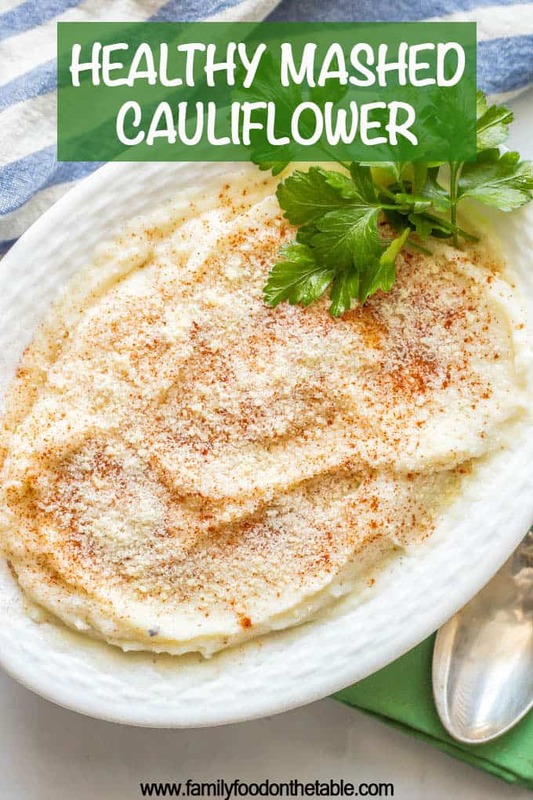 Healthy mashed cauliflower is creamy, smooth and an easy, delicious low-carb option for a dinner side dish. Drain the cauliflower well and pay dry to get off any extra moisture. 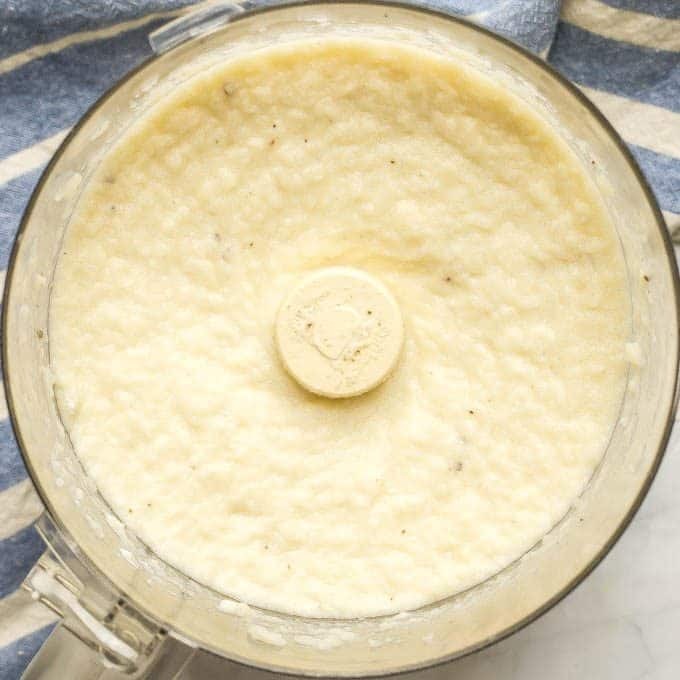 Transfer the steamed cauliflower to a food processor. Add the remaining ingredients, starting with 2 tablespoons of butter, and process until smooth. 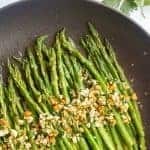 Taste and add salt, pepper or more butter as desired. 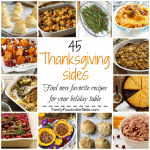 Serve hot with desired toppings and enjoy! Don’t forget the toppings! 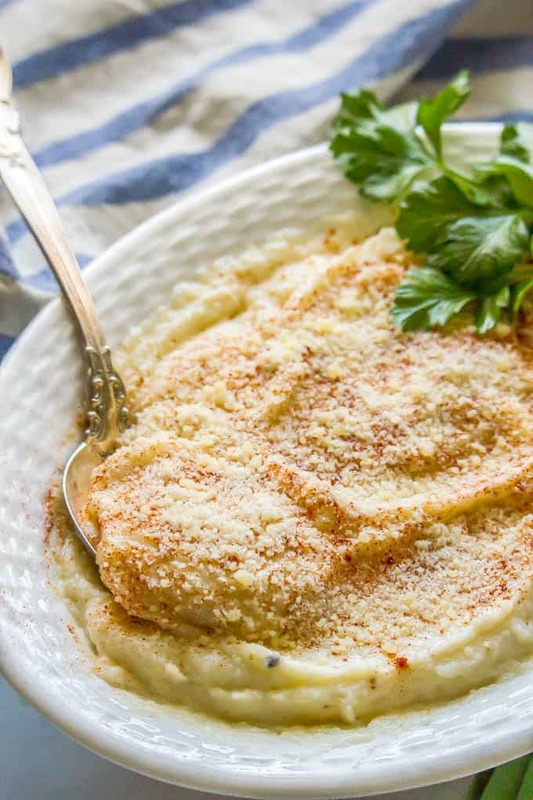 Add any of your favorite mashed potato toppings to this - extra butter, chives, a sprinkling of paprika, shredded cheese or cooked, crumbled bacon.